The examples shown below use the user defined functions (UDFs) Eval and EvalU. Eval returns the value of any function entered as text on the spreadsheet, substituting given values for any parameters. EvalU is a “unit aware” version, returning the result in base SI units, or in any specified units. EvalU returns the calculated units if they are not specified, or an error message if the specified output units are not consistent with those calculated from the input units. EvalU now returns calculated units of N, as expected, and both versions of the formula return very similar results in N. Also note that when the output units are consistent with the input units (either lbf or N), EvalU and Eval return exactly the same value, as would be expected. With the revised formulas the EvalA results are correct, but the Eval results, ignoring the input units, are now incorrect, because the input units are inconsistent (stresses are in ksi or MPa, but forces are in lbf or kN). The units are case sensitive, so if Excel helpfully insists on correcting MPa to Mpa, the units will not be recognised. To avoid this problem go to File-Options-Proofing, click AutoCorrect Options, and either unselect “Correct TWo Initial CApitals, or click Exceptions and add MPa to the exceptions list on the Initial CAps tab. For a quick one-off you can also enter a space after MPa, then press Ctrl-Z. Both input units and output units (if used) must be recognised units with the correct abbreviation. 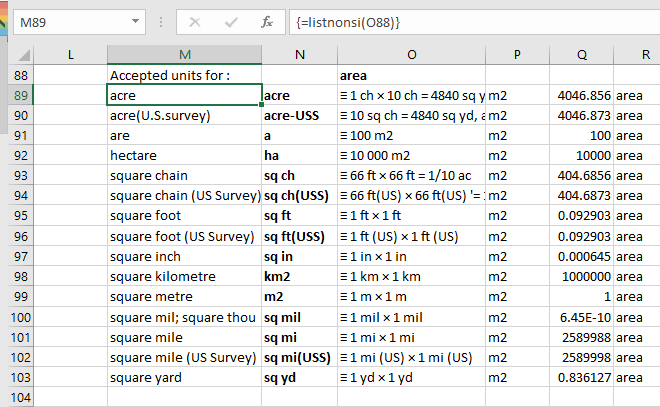 The ListNonSI UDF will list all recognised units for any specified unit type, for example “area” as shown in the screen-shot below. To display all the results enter the function with the unit type, then press Ctrl-Shift-S to resize the output array. The third example shows the US units formula evaluated with fc in MPa, and return units specified as psi, showing exact agreement with the US units version. 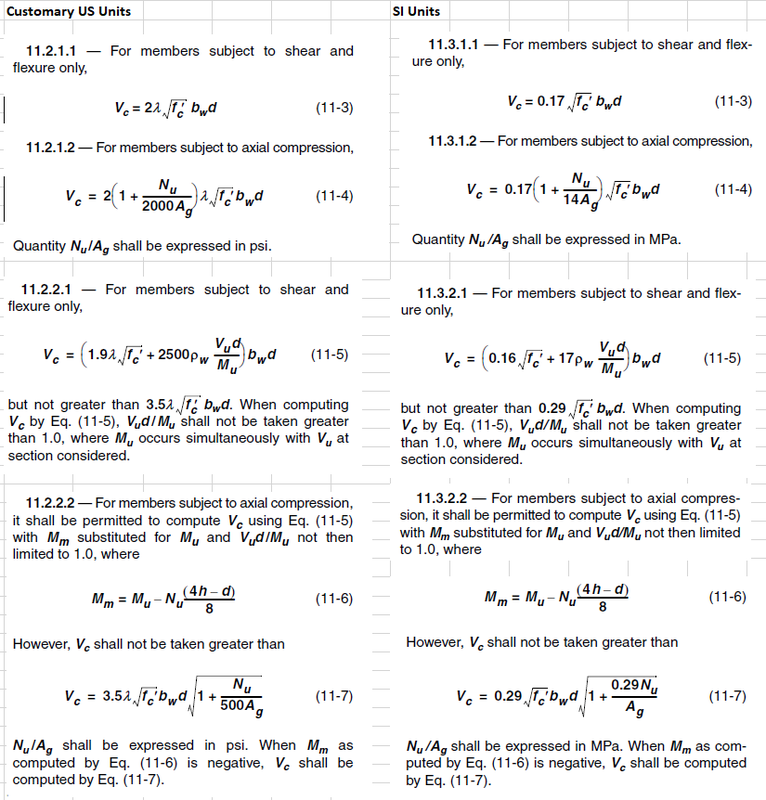 This entry was posted in Concrete, Excel, Maths, Newton, UDFs, VBA and tagged ACI 318, Customary US Units, Eval, EvalU, Evaluate text, Excel, Implied units, shear capacity, SI Units, UDF, Units aware, Units4Excel, VBA. Bookmark the permalink.